Google, Microsoft and VMware all held sway among survey respondents asked about public cloud computing companies, though Amazon retained its top spot in the public cloud market. 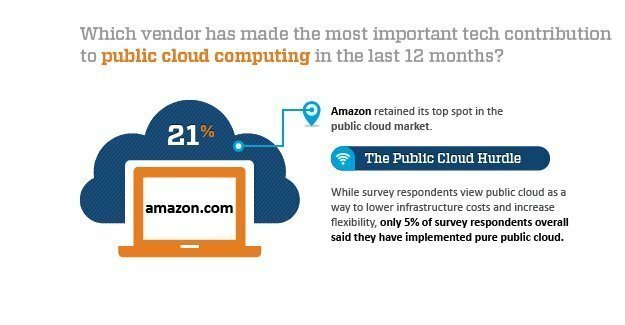 Amazon Web Services Inc. has made the most important technological contribution to public clouds for enterprise IT, said about 21% of survey respondents that answered the cloud questions. No surprise that Amazon garnered the most votes, but it was closely chased by Microsoft (about 20% of votes), VMware (about 15%) and Google (about 12%). While survey respondents view public cloud as a way to lower infrastructure costs and increase flexibility, only about 5% of survey respondents overall said they have implemented pure public cloud. Just over 13% said they use a hybrid public and private cloud infrastructure. This hybrid cloud computing approach could explain the high marks for Microsoft and VMware, which are not typically thought of as public cloud providers.